The initiative is part of the NHS-wide response to the Francis Report which called for greater openness and transparency in the health service. Here at The Dudley Group we take the safety of our patients very seriously and are committed to making sure we provide all of our patients with the highest quality care possible. We publish information about our staffing levels on a monthly basis and a full report of our nursing and midwifery staffing levels is taken to our monthly Board of Directors meetings. 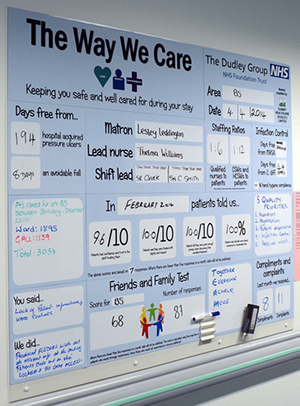 We also display real-time information about our staffing levels on our Patient Safety Huddle Boards on our wards. Overall, we are pleased to report that the Trust exceeds the minimum guidance ratio of one nurse to eight patients. On occasions, where ward staffing does not meet patient dependency, this is escalated to the matron and extra support staff are sought from the Trust’s internal staff bank and in extreme situations staff are moved from a ward with less dependent patients to ensure safe care at all times.